It's virtually time! The next day to come Apple is a media event organization , which is talking about the iPhone. 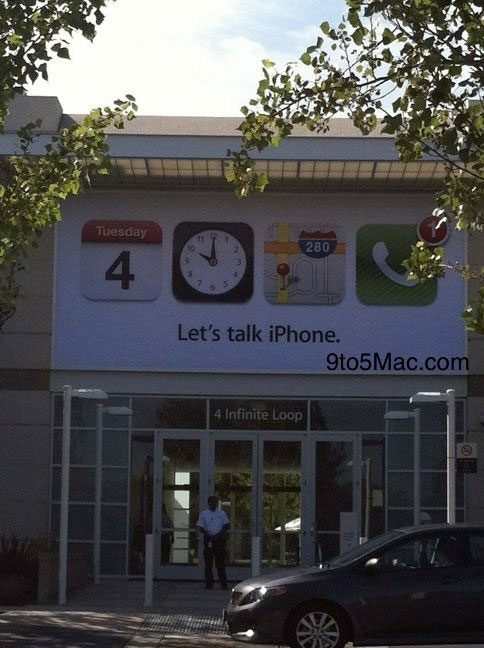 At Apple headquarters in Cupertino is already a "Let's Talk iPhone' banner hung just outside the auditorium on campus. The icons on the banner are similar to those on the invitation: October 4th, 10:00 pm, the location on Infinite Loop in Cupertino and the phone icon with the number 1 on it. Who ever was on campus: the announcement at 4 Infinite Loop. It holds 200 to 250 people in the auditorium.The photo was made ​​by a reader of 9to5mac .